Combining the benefits of a readily flowable Zinc Oxide dispersion with Hallstar’s patented photoprotection expertise, Hallstar’s newest additions to our mineral dispersion line include HallBrite® EZ-FLO ZDX and HallBrite® EZ-FLO ZDX Plus. These products combine the benefits of industry-leading non-nano ZnO performance with built-in photoprotection technology. When tested against major industry benchmarks for SPF and UVA-PF, much higher UVB protection (SPF) is achieved while maintaining comparable UVA protection (PFA). 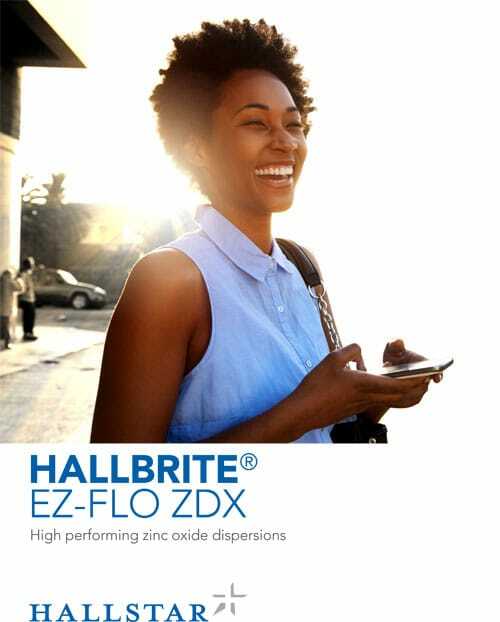 HallBrite® EZ-FLO ZDX is manufactured in a cGMP environment and consists of highly dispersed Triethoxycaprylylsilane-coated Zinc Oxide (60% active) in HallBrite® BHB which work together to prevent ZnO interaction with organic compounds and eliminate conglomeration. The result is a highly stable, easily pourable dispersion that delivers elegant, smooth lotion consistency without any perception of particulates. HallBrite® EZ-FLO ZDX is China approved, enabling the formulation of global broad-spectrum sun protection products. Recommended use levels are up to 13% for Canada, 19% for Australia and 28% elsewhere.